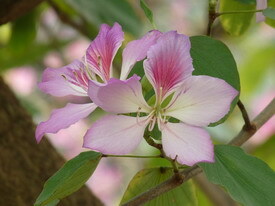 Hong Kong Orchid Tree, Bauhinia x blakeana, is a seedless species which only flowers but not fruits. It propagates asexually by either ‘cuttings’ or ‘grafting’. ‘Cuttings’ is to bury a piece of stem in the soil, including at least one leaf node. 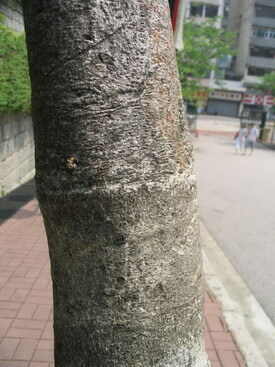 The cutting is then able to produce new roots, usually at the node. This method is slow and may result in bending trunks. 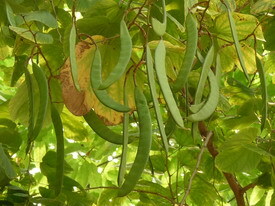 ‘Grafting’ is usually adopted by orchard farmers. The shoot of a selected, desired tree is grafted onto the rootstock of another species in the same genus. It can reduce the time to flowering and shorten the hybrid breeding program. I have a notion. Inasmuch as Bauhinia x blakeana is the hybrid of Bauhinia variegata and Bauhinia purpurea more than a century ago, if in a Bauhinia purpurea tree with three shoots, we graft on with Bauhinia x blakeana and Bauhinia variegata respectively; then, the differences of the three species can be shown in the month of flowering/fruiting. 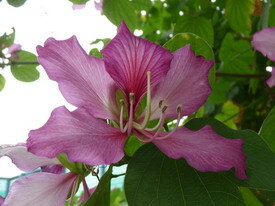 In March, this tree will be with flowers of Bauhinia x blakeana and Bauhinia variegata, plus fruit of Bauhinia purpurea.